The pediatric CML steering committee of the international BFM group (I-BFM) has recently published the guidelines for treatment and management of pediatric CML in the British Journal of Haematology. The authors are pediatric experts from from United Kingdom, France, Italy, Netherlands, Belgium, and Germany. These guidelines will contribute to harmonisation of treatment of children and adolescents with CML. See our "Junior CML Advocates" section on cmladvocates, specifically the section "Scientific Publications" where the full text is available for download. Alternatively, you can access the full article by clicking here. 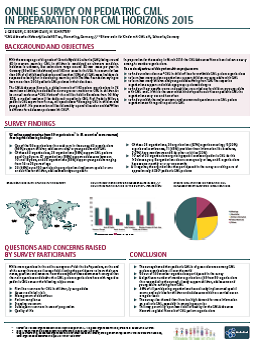 The results of the survey were made available in form of a poster. The authors of the poster were: J. GEISSLER (CML Advocates Network/LeukaNET e.v., Riemerling, Germany), C. BOROWCZAK (Elternverein für Kinder mit CML e.V., Schwerte, Germany), N. SCHRÖTER (CML Advocates Network/LeukaNET e.v., Riemerling, Germany). Click here to see the full poster! The CML Advocates Network has decided to devote greater attention to CML in children. At its annual conference “CML Horizons 2015” that was held in Barcelona from 1-3 May 2015, a full medical session was dedicated to pediatric CML. Prof. Frederic Millot, a pediatric CML expert from France, spoke about “Managing CML in children and young adults”. His presentation was followed by a panel discussion entitled “What is different for adolescent patients with CML?” You can now download Prof. Millot´s presentation here. Video web streams of the session will be available soon! The "CML Advocates Network", the international platform of patient groups supporting patients and relatives suffering from Chronic Myeloid Leukaemia, and the International CML Foundation join forces to support young patients affected by that rare form of leukaemia, as well as physicians and researchers. The project, launched on International Childhood Cancer Day on 15 February 2011, will encompass a range of activities to support collaboration and sharing of experience of parents of young patients as well as physicians treating children with this ultra-rare condition.